For something different today, Quincy, from Janet Cantrell's Fat Cat series, would like you bring you a word search puzzle. Have fun! Hi Janet! I found DUEL too! HA! The program snuck that one in there. This was fun; I love word searches. Thank you! You're welcome! They're fun to put together, too. Fun time with this word search, thanks. 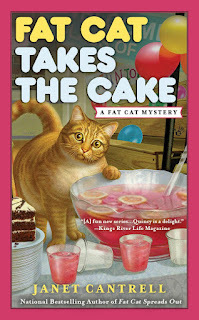 I read the first Fat Cat book and loved it. Wish I had these books on CD's or MP3's. Love listening to books while driving and especially when traveling. I don't know why Berkley doesn't do audio books. That would be nice! Thanks for stopping by.